Palm trees, sunshine and…ice skating? Some might think it’s a weird combination, but for Angelenos it’s just holiday fun as usual! 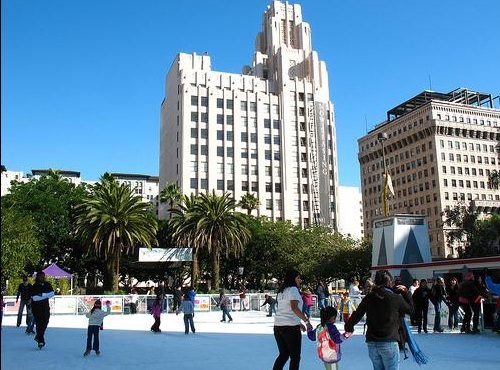 Go Metro to the Holiday Ice Rink Pershing Square and enjoy the cooling weather in a way that’s uniquely DTLA. The ice rink opens today and will remain in Pershing Square until January. Hours of operation vary, so make sure to check their website before heading to the rink. Besides regular skate sessions, there are special skates especially for families, dance music lovers, singles — you name it! General admission is $9, but show your valid TAP card to receive $1 off. And you can bring your own skates or rent a pair for $3. To get to the rink, take the Metro Red or Purple Line to Pershing Square Station. For more routes and connections, use Metro’s Trip Planner.